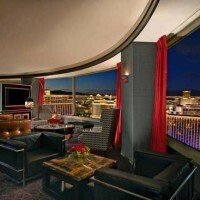 These Las Vegas wedding venues include some of the most fantastic suites in the city, for use as an intimate wedding ceremony spot or a casual post-wedding cocktail party. 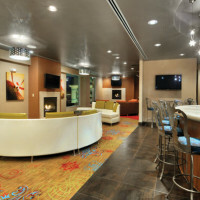 Using suites remains a popular option for couples looking for an intimate, personalized affair while staying on budget. Having an in-suite wedding ceremony or reception has benefits and drawbacks, so be sure to read our tips on Organizing and Decorating Your Insuite Wedding Ceremony and Planning a Perfect In-Suite Wedding Reception. The Wedding Suite on the 36th floor on the Eastside Tower of Cosmopolitan puts an original twist on the classic ceremony. Purposefully designed without the traditional aisle and ceremony seating, guests stand in awe as vows are exchanged either in-suite or on the private wraparound terrace overlooking the heart of Las Vegas Boulevard. With breathtaking backdrops and gorgeous views, the Wedding Suite provides the perfect venue for a memorable wedding experience or vow renewal. In addition to the stylish common area and terrace, there are also separate lounge spaces for the Bride and her party, or for guests to mingle and relax. 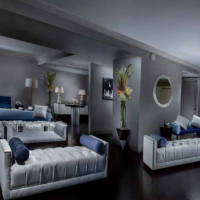 The Suite can be customized with your selected décor and amenities and accommodate up to 40 for a luxurious cocktail reception feel or up to 25 for a seated, intimate ceremony. Reception Options: Wedding suite bar packages start at $30 per person per hour. Hors d’ouevres from $35 per person. In-house catering for buffet and plated meals from $105 per person, with charcuterie, mixed hot and cold items, seafood displays, and mezze being additional add-ons. If the Cosmopolitan Wedding Suite is too luxe, you might also consider a Terrace, Wraparound Terrace or West End Penthouse suite for a small wedding ceremony or reception. 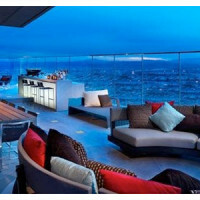 Capacities are eight guests in a Terrace, 12 in a Wraparound Terrace and up to 35 in a West End Penthouse. Reception Options: In-house catering for buffet and plated meals starts $105 per person. Bar packages start at $29 per person. See real weddings in suites featured on Little Vegas Wedding. Popular choices at Mandalay Bay for in-suite parties are the Vista and Media suites, which are great for intimate wedding ceremonies, pre-wedding meet and greets or parties as well as post-wedding cocktail parties and receptions of up to 40 people. Great views, open floor plans, affordable pricing and ease of getting items up to the room make these suites winners for DIY wedding ceremonies and receptions. The Hospitality suite is an option as well, but there is no bedroom in it, and slightly less seating. Ceremonies are slightly different and can be a bit more challenging for different reasons, as you want to make sure everyone can see and hear your vows. 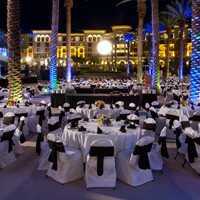 See real weddings in Mandalay Bay suites featured on Little Vegas Wedding. Some wedding packages at Planet Hollywood include in-suite receptions in a Panorama Suite, either a cake and champagne toast and a three night stay in the suite (Twilight package) or a cocktail and hors d’oeuvres reception and two night stay (Princess Bride package.) Measuring 1,255 square feet and offering a 180-degree view of the Strip, each Las Vegas room features its own Hollywood theme. Themes vary from James Bond, Marilyn Monroe, Batman, Star Trek, Will Smith, Back to the Future, The Wizard Oz and much more. Other features include an oversized soaking tub with retractable wall and multiple flat-screen TVs. Green Valley Ranch is a luxury off-Strip resort and casino that offers a Mediterranean style of architecture with a variety of indoor and outdoor venues for your wedding. Outdoors: Piazza and Grand Staircase offers a theatre-style wedding ceremony venue, Vineyard a more intimate garden style wedding for just 15 guests. Opium Terrace is poolside and works for smaller or larger weddings. The Ampitheatre will host up to 400 guests, nestled within vineyards and rose gardens. Indoors, you can find the ballroom for up to 2,000, Library Patio for intimate 25 guest weddings or choose a Green Valley Ranch suite for private vows. Site fees are additional to wedding ceremony packages. Catering minimums are for 20 guests or more. Buffets from $74-110 per person with display stations and action stations available. Plated meals are possible for an up charge. Bar packages from $24 per person. 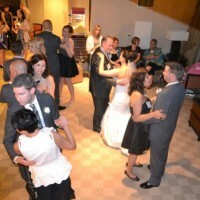 The lounge-style Stardust Suite at Orleans is a popular choice for in-suite weddings in Las Vegas. The property is a little off Strip, providing great Strip views, and the large 2,500 square foot suite on the 21st floor offers contemporary decor and furniture, a dancefloor, two bathrooms, a bar, 11 plasma TVs, a balcony and lots of seating. It would even be likely to hold a small wedding ceremony in the space. There is a catering minimum for the suite, which covers the venue fee. The food and beverage minimum is easily met and may be used on liquor, buffets, appetizers and more. Buffets: $40-49 per person, plated meals $35-49. $20-32 per person for hosted bar packages. This amazing 7,500 square foot suite on the 20th floor of the modern Red Rock Hotel + Casino west of The Strip in Summerlin is named after the stunning 180 degree views of the entire Vegas valley and Red Rock mountains. 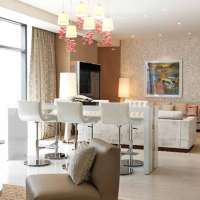 The sleek suite offers high tech luxuries including electronic rotating sofas and Japanese electronic toilet seats as well as a 12 person dining table inside, 10 person table outside, bar and amenities such as a billiards table and Jacuzzi, bar and lounge furniture on the terrace. Catering is not included.